To the west of the town of Trim, and just to the south of the Tremblestown River is a four storey tower whose unseen upper north side walls project outwards supported on a row of corbels. The south side has a blocked arch high up, and a portcullis groove, indicating that the building may once have served as a gatehouse of a bawn. Am really delighted to now be registered with Geograph. and am looking forward to using the site as you suggest. 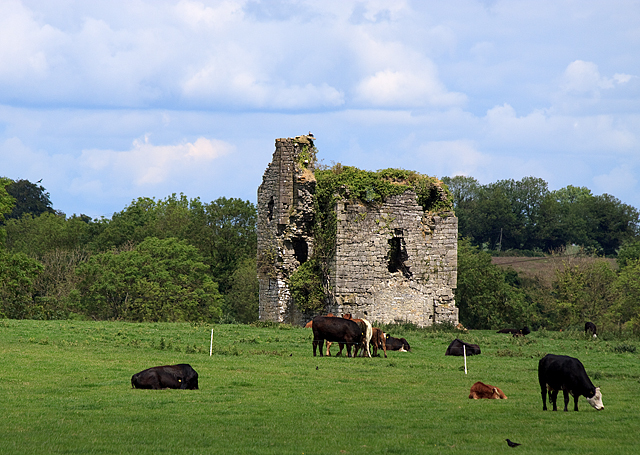 I was doing a search for some history of the area I live in here in Newhaggard in Co. Meath Ireland, when I came across the Geograph site and this photo of Newhaggard Castle. As a child growing up here I played in and around this ruin, but still know very little about it or how it came to be here. It overlooks the River Boyne and Newhaggard Mill, and is situated in the same field (known as the Lower Lawn) as Newhaggard House. If there is anyone reading this who might have more information about this castle, it's history/ origins and it's surroundings I would very much like to hear from them.